GPS apps like Waze direct drivers down otherwise quiet streets. 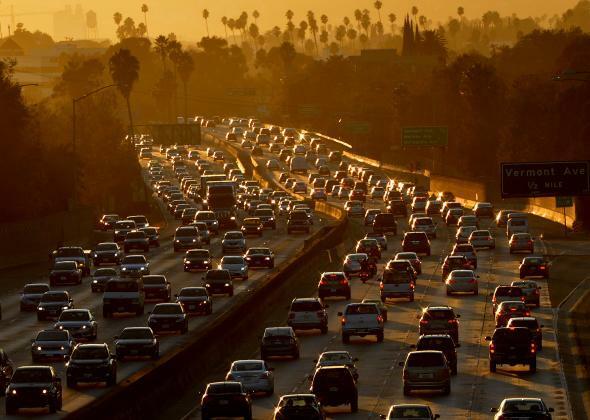 The 101 Freeway in Los Angeles. Would you want all of this on your quiet residential block? When getting directions from a smartphone, we tend to do whatever the app recommends. It’s just easier than thinking critically about whether it’s the best route. And the whole point is that the app knows, right? But that means those automatically generated driving directions have a lot of power, and in Los Angeles, they’re bringing traffic where locals think it shouldn’t go. The Associated Press reports that over the past couple of years, the traffic and navigation app Waze (which crowdsources data from its users) has been prompting L.A. drivers to use quiet residential streets as shortcuts to either approach busy highways or avoid them altogether. Paula Hamilton, who lives in the Sherman Oaks neighborhood, told the AP, “The traffic is unbearable now. You can’t even walk your dog.” And residents of many communities say they’ve heard neighbors threaten to skew Waze’s data by reporting phony accidents and false traffic conditions. No one would admit to doing it on the record, though, and Waze representative Julie Mossler says that the app can’t be gamed this way. Even if a bunch of folks coordinate to report traffic at a certain time, drivers passing through who have the Waze app running will generate data that contradicts the falsified reports. Residents have been complaining to city council members and other local officials about congestion on neighborhood streets and along back routes that were formerly only used by knowledgeable locals. With 7.6 million registered vehicles and a reputation for the country’s worst traffic, though, it’s hard to imagine that any routes could stay secret forever in L.A.
A similar battle has been going on near the Hollywood sign. The approach to the sign is confusing, which used to keep tourists at bay. But a few years ago, smartphone directions began helping them make it all they way there. The ensuing gridlock made local residents unhappy and created a fire hazard in the dry hills around the sign, where narrow streets made it difficult for fire trucks to weave around endless lines of cars. As Alissa Walker reported in Gizmodo last month, a group of angry neighbors plus a city council member have succeeded in convincing Google Maps, Apple Maps, and Bing to change their suggestions about how to get to the sign so you end up at viewing spots that are nice, but far away. Even the walking directions to the sign try to lead you astray. Given that anyone has a right to take a public road or trail to whatever destination they choose, it’s certainly controversial for local interests to change what feels like public information (maps data) in this way. But local residents also have legitimate safety claims. For those fighting Waze, it seems like a losing battle for now. Who knew that the algorithms spitting out fastest route data had so much power?